If you’re near London or planning a visit and love African art, then the brand new Colours Of The Kalahari exhibition at The Mall Galleries, London is a real treat – and it’s free too! The Bushman (San People) Art Exhibition, the first of its kind in the UK, has more than 150 original pieces of art from over 30 leading African artists. You may already have seen some designs by the talented Cg’oise, one of the San’s most celebrated artists, as he designed the tail fins of some British Airways jumbo jets. The collection colourfully depicts hunting, religion, dancing and the everyday struggle for survival of the San people now and thousands of years ago. The Bushman art movement isn’t just about beautiful pictures either as they work to benefit the community of Namibia in Southern Africa. 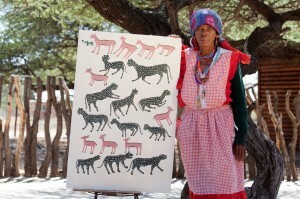 A percentage of proceeds from pieces bought at the exhibition – a collaboration between the Namibian Tourism Board, The Redbush Tea Company and the Born Free Foundation – will go back to the San communities to support the indigenous people of the Kalahari and also to the Born Free Foundation’s lion conservation work in South Africa. London runs from 9-13 September 2013. Admission is free. For more information go to redbushtea.com or bornfree.org.uk. This event is sponsored by the Namibia Tourism Board. Fancy camping but are looking for something a bit different this year? Take our fun family quiz!